Author: Roland Kießling, Maarten Mous. Series edited by: Hans-Jürgen Sasse †. 10 pp. Roman, 358 pp. Traditionally, the four closely related languages Iraqw, Gorwaa (Gorowa), Alagwa and Burunge, all spoken in Tanzania in the south of Arusha, are devided into a Northern and Southern West-Rift (W-R) language group, which together form a branch of Southern Cushitic. The two belonging to Northern W-R are Iraqw and Gorwaa, whereas Alagwa and Burunge are assigned to the Southern W-R sub-group. The lexical and phonological reconstructions of Kießling and Mous have led to a different picture of the internal relations within West-Rift. Though the claim of a Northern and Southern West-Rift group has been maintained, phonological and morphological evidence isolates Burunge as the only modern representative of Southern W-R. Northern W-R must have undergone several splits: First an Iraqwoid and Alagwoid group have developed. From Iraqwoid, Iraqw and Gorwaa have been split, the modern representative of Alagwoid is Alagwa. A seemingly superficial closeness of Burunge and Alagwa is a consequence of massive contact. The aim of this work is to provide a solid lexical reconstruction of West Rift Southern Cushitic. 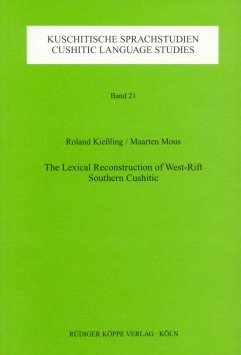 The authors claim that a reconstruction of Proto-West-Rift is the best possible approximation for the lexicon of Southern Cushitic in general. The lexical reconstruction provides insights into the history of the West-Rift languages and their subclassification. Through charting the history of the languages, this reconstruction in turn allows for interpretation about the history of the peoples themselves and suggests directions of future sociohistorical, ethnographical and archaeological research. The comparative lexicon consists of c. 3.000 lexical units, beginning with the reconstruction and including the singular & plural forms quoted separately, plus most important derivatives. From the perspective of the comparative-historical Cushitic studies perhaps most valuable data are included: the parallels from other Cushitic languages, especially East Cushitic, besides the external parallels from neighbouring Nilotic and Bantu languages and Sandawe. [...] Summing up, the monographs of Kießling and Mous [Kießling 2002, Kießling/Mous 2003] present the West Rift grammar and lexicon in reconstructions based on the extraordinary strict methodology. They offer at our disposal a maximum of possible in this field. The book [...] is a result of cooperation between two linguists specializing in grammatical descriptions of African languages. [...] As intended by the authors, the study is a lexical reconstruction of West-Rift Cushitic and also a kind of lexicon of Southern Cushitic. The exclusion of some disputable languages from this description makes the study more homogenous, allowing less semantic divergence between cognates. The improved knowledge of the phonological system helped the authors to include a vowel lengh distinction and tone into the reconstruction, and this seems to be of fundamental importance. Also, the differentiation between languages of common origin and those of intensive contact and mutual influence becomes very basic for the reconstruction procedures. [...] The [...] chapters including West-Rift reconstructions (p. 46-339), possible WR reconstructions (p. 330-332) and an „Index“ (p. 333-358) make up an excellent and complete set of what one might expect from a study on the subject. Thus we say ‘na’ás na’amaamis’, ‘thank you very much’ (cf. The Preface of Vol. 19 and Vol. 21) to the two authors for their historical sociolinguistic approach, i.e., for their new and original approach in treating (Proto-)Cushitic languages.